Trace shapes to cut the fabric and paste them together to create your own favorite animals. Having a fully-developed set of fine motor skills is very important for kids to start learning how to write. The skills include coordinating small muscle movements and synchronizing hands, fingers, and eyes. Kids can practice and develop these skills over time, for example by using thumb and other fingers to pick up small things. As parents, you can also help improving your kids’ fine motor skills by tracing lines and patterns on the iPad. Labo Fabric Friends is a good app for this. Using various templates, kids can trace and cut fabric to form cute animals, such as bear, rabbit, and pig. The first thing you do in Labo Fabric Friends is choosing which animals you want to make, based on the sketches available in the main menu. These include fox, sheep, elephant, lion, deer, panda, penguin, and cow. Once you select an animal, you start tracing shapes based on the template to cut the fabric and paste it on a piece of paper. You may need to cut several pieces from different fabric types depending on the template you chose. The next step is to drag the body parts (such as arms, legs, and ears) to assemble the animal. Upon completion, the app will automatically sew the animal shape and cut the paper accordingly. You can then choose accessories to make your creation more personal. These include glasses, mustache, head bands, and caps. Now, you’re ready to play the mini games. There are six mini games that you can play with your newly created fabric friends. Some of the mechanics are quite familiar, for example hide-and-seek game, music rhythm game such as Labo Dancing Kids, and tomato fight using catapult a la Angry Birds. There are also new mechanics, such as jumping on a pogo stick to collect items and a rock-paper-scissors game where you choose the winning hand against the opponent who has already revealed his hand. Based on most of the mini games, Labo Fabric Friends is suitable for kids ages 4 and up. The only exception is the mini game where you need to find the missing letter in a word. For example, the app will say “p-nda”, and you need to find which letter fits the empty space. This game is more appropriate for older kids who already know how to pronounce simple words. Labo Fabric Friends works great in Airplane mode. It doesn’t have any in-app purchases, advertising, or links to social networks. It’s great for art and creative play, covering related topics such as animals, shapes, and reading. There are six mini games that you can play with your new fabric friends. Labo Fabric Friends has inspired my five-year-old and I to create our own DIY projects. Using the app as a guide, we cut out shapes from scrap papers and pasted them together to create different animals. Since we didn’t have access to the printed version of the templates, we drew them ourselves. Labo Fabric Friends is a great example that it’s possible to easily and quickly create cool DIY project with a minimum budget. The app keeps all characters that you have created. You can access these characters by tapping on the Gallery icon from the main menu. 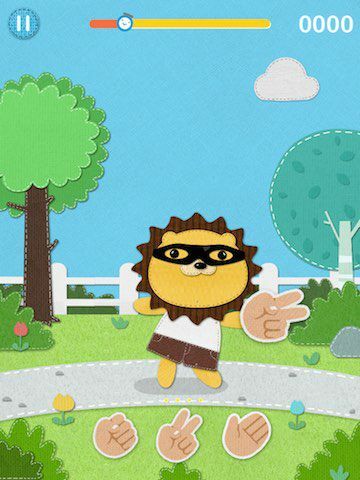 You can also invite them to join the current character in the music rhythm game, similar to Labo Dancing Kids. Labo Fabric Friends also includes fresh game mechanics, such as this rock-paper-scissors game. Labo Fabric Friends is a fun tracing app for kids ages 4+ who love to create their own fabric animal friends. The included mini games are fun to play and offer fresh mechanics. The app is also a great source of inspirations for your upcoming DIY projects.